Home » Science » Why Were Some Dinosaurs so Large ? 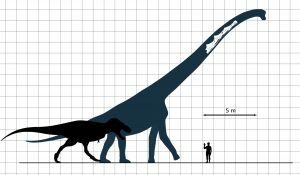 From the fossil evidence, it’s clear that, species by species, individual by individual, dinosaurs were more massive than any other group of animals that has ever lived on land. It’s as if today’s laws of physics didn’t apply back then allowing them to grow to such a gigantic size. For example, plant eaters like Diplodocus and Brachiosaurus weighed in the neighbourhood of 25 to 50 tons, whilst carnivores like Tyrannosaurus Rex or Spinosaurus tipped the scales at 10 tons. It may come as a rather inconvenient truth, in these days of smug confidence that science can explain everything, to find out that “there are just some things that we don’t know the answer too – and may never really know for sure”. This question is one of those. For all practical purposes, the temperature was the same everywhere on the Earth’s surface. There was no ice at the poles nor was there ice at the top of the highest mountains. From the equator to the poles, and from the lowest dry valley to the highest mountain, there was no more than a few degrees difference in temperature. Consequently the vegetation was so thick it would have required special adaptation to live here. The dinosaurs therefore evolved with a main purpose to clear this abundant forestation. Theory #1 might seem a bit simplistic, the mere availability of huge amounts of vegetation doesn’t necessarily entail the evolution of giant animals that can chew and swallow it down to the last shoot. Evolution tends to work along multiple paths, and the fact is that the drawbacks of dinosaur gigantism (such as the slow speed of individuals and the need for limited population size) could easily have outweighed its benefits in terms of food-gathering. That said, some paleontologists do believe that gigantism conferred an evolutionary advantage on the dinosaurs that possessed it: for example, a jumbo-sized hadrosaur like Shantungosaurus would have been virtually immune to predation when fully grown, even if the tyrannosaurs of its ecosystem hunted in packs to try to take down full-grown adults. Many paleontologists who study giant plant-eating dinosaurs believe that these behemoth dinosaurs were cold-blooded, for two compelling reasons: first, based on our current physiological models, a warm-blooded dinosaur of this size would have cooked itself from the inside out, like a baked potato, and promptly expired; and second, no land-dwelling, warm-blooded mammals living today even approach the size of the largest herbivorous dinosaurs (elephants weigh a few tons, max, and the largest terrestrial mammal in the history of life on earth, an Indricotherium, only topped out at 15 to 20 tons). Here’s where the advantages of gigantism come in. 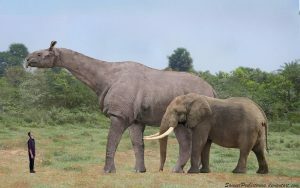 If a sauropod evolved to large-enough sizes, scientists believe, it would have achieved “homeothermy” – that is, the ability to maintain its interior temperature despite the prevailing environmental conditions. For example, a house-sized, homeothermic Argentinosaurus could warm up slowly (in the sun, during the day) and cool down equally slowly (at night), giving it a fairly constant average body temperature–whereas a smaller reptile would be at the mercy of ambient temperatures on an hour-by-hour basis. Rather perversely there’s a theory to explain giganticism that’s exactly the opposite of the previous theory! Those who believe that dinosaurs were warm-blooded also claim that is a factor in their large size. They point out that the uninsulated skin of dinosaurs was a source of heat loss, and the lower ratio of surface area to mass in larger dinosaurs would have protected them from the chilling effects that would have been dangerous to a warm-blooded creature. So, to conclude, there are several theories about why some dinosaurs were so massive – but as yet there’s no decisive winner!